The Lenovo Flex System™ x240 M5 Compute Node is a high-performance server that offers enhanced security, efficiency, and reliability features to handle business-critical workloads. The blade server is based on the Intel Xeon E5-2600 v3 processors. It features up to 18 cores and uses new TruDDR4 Memory, which runs at speeds up to 2133 MHz. This product guide provides essential pre-sales information to understand the x240 M5 offering, its key features and specifications, components and options, and configuration guidelines. 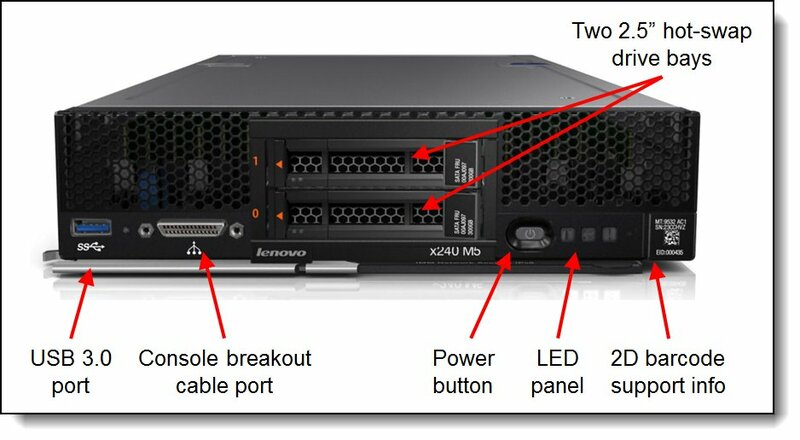 This guide is intended for technical specialists, sales specialists, sales engineers, IT architects, and other IT professionals who want to learn more about the x240 M5 compute node and consider its use in IT solutions. Withdrawn: The Flex System x240 M5 with E5-2600 v3 processors is withdrawn from marketing. The replacement system is the x240 M5 with E5-2600 v4. Suggested uses: Database, virtualization, enterprise applications, collaboration and email, streaming media, web, HPC, and cloud applications. Figure 1 shows the Flex System x240 M5 Compute Node. The x240 M5 Compute Node uses TruDDR4 Memory DIMM technology, which offers higher clock speeds, faster data transfer rates, and runs at a lower voltage (1.2V). With DDR4 technology, memory DIMMs can now operate at speeds up to 2133 MHz, which provides lower latency times and enhanced computing power. The TruDDR4 Memory portfolio includes RDIMMs with advanced error correction for reliability, performance, and maximum memory capacity. In addition, TruDDR4 Memory supports memory performance that exceeds industry standards. The x240 M5 Compute Node integrates leadership security and reliability. System x Trusted Platform Assurance, an exclusive set of System x features and practices, establishes a foolproof security foundation for your workloads. Enterprise-class data protection is provided with optional self-encrypting drives and simple, centralized key management through Security Key Lifecycle Management. Diagnostic tools facilitate reduced downtime and costs. The Flex System x240 M5 Compute Node is a high-availability, scalable compute node that is optimized to support the next-generation microprocessor technology. It is ideally suited for medium and large businesses. This section describes the key features of the server. Supports up to two processors, 36 cores, and 72 threads, which maximizes the concurrent execution of multi-threaded applications. Intel Advanced Vector Extensions 2.0 (AVX 2.0) enable acceleration of enterprise-class workloads, such as databases and enterprise resource planning. Supports the Storage Expansion Node, which provides another 12 hot-swap, 2.5-inch drive bays for local storage. Up to 32 virtual I/O ports per compute node with available 10 Gb Virtual Fabric Adapters, which offers the choice of Ethernet, iSCSI, or Fibre Channel over Ethernet (FCoE) connectivity. The x240 M5 offers PCI Express 3.0 I/O expansion capabilities that improve the theoretical maximum bandwidth by 60% (8 GT/s per link), compared with the previous generation of PCI Express 2.0. Support for high-bandwidth I/O adapters, up to two in each x240 M5 Compute Node. Supports the PCIe Expansion Node for support for up to six more I/O adapters. Hot-swap drives support integrated RAID 1 redundancy for data protection and greater system up-time. A light path diagnostics panel and individual light path LEDs to quickly lead the technician to failed (or failing) components. This feature simplifies servicing, speeds up problem resolution, and helps improve system availability. Solid-state drives (SSDs), which offer significantly better reliability than traditional mechanical HDDs for greater uptime. Built-in Integrated Management Module II (IMM2) continuously monitors system parameters, triggers alerts, and performs recovering actions if there is a failure to minimize downtime. Built-in diagnostics that uses Dynamic Systems Analysis (DSA) Preboot speeds up troubleshooting tasks to reduce service time. Includes an IMM2 to monitor server availability and perform remote management. Integrated Trusted Platform Module (TPM) 1.2 and 2.0 support (TPM 2.0 requires UEFI 2.21 or later) enables advanced cryptographic functionality, such as digital signatures and remote attestation. Supports Secure Boot to ensure only a digitally signed operating system can be used. Supported with HDDs and SSDs as well as SD Cards in the SD Media Adapter. System x Trusted Platform Assurance, an exclusive set of System x security features and practices, establishes a foolproof security foundation for workloads by delivering firmware that is securely built, tested, digitally signed, and verified before execution. The server offers enterprise-class data protection with optional self-encrypting drives and simple, centralized key management through Security Key Lifecycle Management. The Intel Xeon processor E5-2600 v3 product family offers significantly better performance over the E5-2600 v2 family while fitting into the same thermal design power (TDP) limits. The x240 M5 uses hexagonal ventilation holes, which are a part of Calibrated Vectored Cooling™ technology. Hexagonal holes can be grouped more densely than round holes, which provides more efficient airflow through the system. Form factor Standard-width compute node. Processor Up to two Intel Xeon processor E5-2600 v3 product family CPUs with 18 cores (2.3 GHz), 16 cores (2.3 GHz), 14 cores (up to 2.6 GHz), 12 cores (up to 2.6 GHz) or 10 cores (up to 2.6 GHz), 8 cores (up to 3.2 GHz), 6 cores (up to 3.4 GHz), or up to 4 cores (up to 3.5 GHz). Two QPI links up to 9.6 GTps each. Up to 2133 MHz memory speed. Up to 45 MB L3 cache. Memory Up to 24 DIMM sockets (12 DIMMs per processor). RDIMMs and LRDIMMs are supported. Memory types cannot be intermixed. Memory speed up to 2133 MHz. Four memory channels per processor (3 DIMMs per channel). Memory protection ECC, optional memory mirroring and memory rank sparing. Disk drive bays Two 2.5-inch hot-swap SAS/SATA drive bays that support SAS, SATA, and SSDs. Optional support for 2.5-inch NVMe Enterprise PCIe SSDs. Optional support for up to four 1.8-inch SSDs in place of the two 2.5-inch bays. Up to 12 more 2.5-inch drive bays with the optional Storage Expansion Node. With two 2.5-inch hot-swap drives: Up to 15.4 TB using 2x 7.68 TB 2.5-inch SATA SSDs or up to 4 TB using 2x 2 TB NL SAS HDDs. With two 2.5-inch NVMe SSDs: Up to 4 TB using 2x 2 TB NVMe 2.5-inch G3HS Enterprise Value PCIe SSDs. With four 1.8-inch SSDs: Up to 960 GB using 4x 240 GB 1.8-inch SSDs. More storage is available with an attached Flex System Storage Expansion Node. 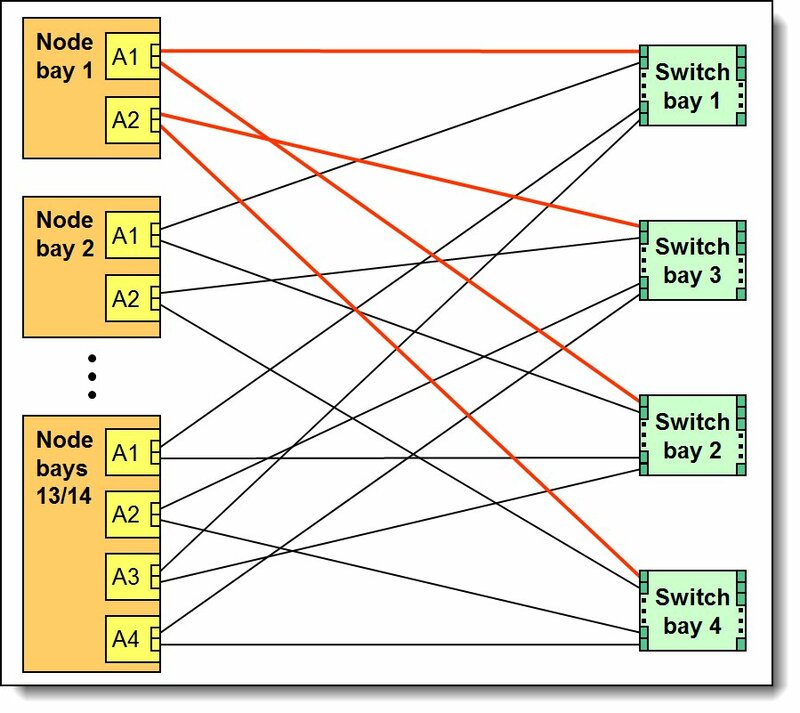 interfaces x2x models: None standard; optional 1 Gb or 10 GbE adapters. x4x models: Two 10 GbE ports with EN4172 2-port 10Gb Ethernet Adapter. x6x models: Two 10 GbE ports with CN4052 2-port 10Gb Virtual Fabric Adapter. slots Two I/O connectors for adapters. PCI Express 3.0 x16 interface. Includes an Expansion Connector (PCIe 3.0 x16) to connect an expansion node, such as the PCIe Expansion Node. PCIe Expansion Node supports two full-height PCIe adapters, two low-profile PCIe adapters, and two Flex System I/O adapters. 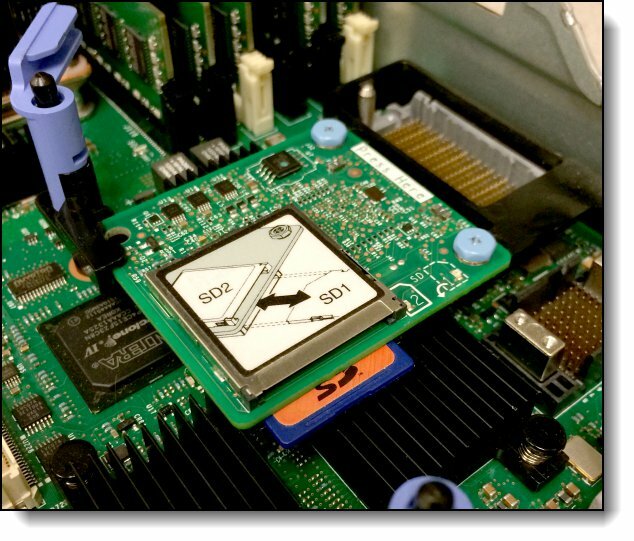 Internal: Optional SD Media Adapter provides two SD Media slots for VMware vSphere hypervisor support (RAID 1 pair). Systems management UEFI, Integrated Management Module 2 (IMM2) with Renesas SH7758 controller, Predictive Failure Analysis, light path diagnostics panel, automatic server restart, remote presence. Support for Lenovo XClarity Administrator, IBM Flex System Manager™, IBM Systems Director, Active Energy Manager, and Lenovo ToolsCenter. Security features Power-on password, administrator's password, Trusted Platform Module (TPM) 1.2 and 2.0 (TPM 2.0 requires UEFI 2.21 or later). Service and support Optional service upgrades are available through Lenovo warranty services: 4-hour or 2-hour response time, 8-hour fix time, 1-year or 2-year warranty extension, remote technical support for Lenovo hardware and selected Lenovo and original equipment manufacturer (OEM) software. Dimensions Width: 215 mm (8.5 inches), height 51 mm (2.0 inches), depth 493 mm (19.4 inches). Weight Maximum configuration: 7.1 kg (15.6 lb). Table 2 lists the standard models. Withdrawn from marketing: All standard models are now withdrawn from marketing. The replacements are models of the x240 M5 with E5 v4 processors. * Processor detail: Processor quantity, model, cores, core speed, L3 cache, memory speed, power TDP rating. † The two 2.5-inch drive bays can be replaced with four 1.8-inch SSD bays. The following table lists the available models that are NEBS compliant when used with the Lenovo Flex System Carrier-Grade Chassis, 7385-DCx. Withdrawn from marketing: All NEBS models are now withdrawn from marketing. The following table lists the available TopSeller models. Withdrawn from marketing: All TopSeller models are now withdrawn from marketing. The replacements are models of the x240 M5 with E5 v4 processors. 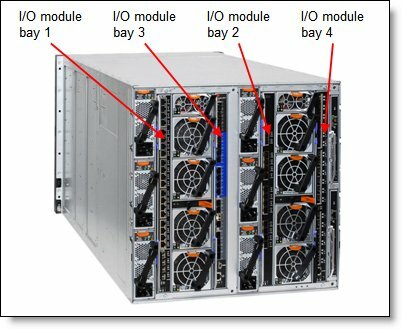 The x240 M5 Compute Node is supported in the Flex System chassis as listed in the following table. The x240 M5 supports the processor options that are listed in the following table. The server supports one or two processors. The table also shows which server models have each processor standard, if any. * The first feature code is for processor 1 and second feature code is for processor 2. TruDDR4 Memory uses the highest quality components that are sourced from Tier 1 DRAM suppliers and only memory that meets the strict requirements of Lenovo is selected. It is compatibility tested and tuned on every System x server to maximize performance and reliability. TruDDR4 Memory has a unique signature that is programmed into the DIMM that enables System x servers to verify whether the memory that is installed is qualified or supported by Lenovo. Because TruDDR4 Memory is authenticated, certain extended memory performance features can be enabled to extend performance over industry standards. From a service and support standpoint, Lenovo memory automatically assumes the Lenovo system warranty and Lenovo provides service and support worldwide. The following table lists the supported memory options. The server supports up to 12 TruDDR Memory DIMMs when one processor is installed and up to 24 DIMMs when two processors are installed. Each processor has four memory channels, and there are three DIMMs per memory channel (3 DPC). RDIMMs and LRDIMMs are supported, but the mixing of these different types is not supported. UDIMMs are not supported. DIMMs can be installed individually; however, install them in sets of four (one for each of the four memory channels) for performance reasons. Mixing of different types of DIMMs (RDIMM and LRDIMM) in the same server is not supported. The maximum number of supported ranks per channel is eight. The maximum quantity of DIMMs that can be installed in the server depends on the number of CPUs, DIMM rank and operating voltage, as shown in the "Maximum quantity" row in the following table. Lowest maximum operating speed for the selected memory configuration that depends on rated speed, as shown in the "Maximum operating speed" section in the following table. The following table shows the maximum memory speeds that are achievable based on the installed DIMMs and the number of DIMMs per channel. The table also shows the maximum memory capacity at any speed that is supported by the DIMM and maximum memory capacity at rated DIMM speed. In the table, cells that are highlighted in gray indicate when the specific combination of DIMM voltage and number of DIMMs per channel still allows the DIMMs to operate at the rated speed. * The maximum quantity that is supported is shown for two processors that are installed. When one processor is installed, the maximum quantity that is supported is half of that shown. If memory mirroring is used, DIMMs must be installed in pairs (minimum of one pair per CPU), and both DIMMs in a pair must be identical in type and size. If memory rank sparing is used, a minimum of one quad-rank DIMM or two single-rank or dual-rank DIMMs must be installed per populated channel (the DIMMs do not need to be identical). In rank sparing mode, one rank of a DIMM in each populated channel is reserved as spare memory. The size of a rank varies depending on the DIMMs that are installed. The x240 M5 server has two 2.5-inch hot-swap drive bays that are accessible from the front of the blade server (see Figure 2). These bays connect to the integrated ServeRAID M1210e 12 Gbps SAS/SATA controller. The onboard M1210e controller optionally supports self-encrypting drives (SEDs) with the addition of Features on Demand license upgrade, ServeRAID M1200 Series Zero Cache/RAID 5 Upgrade, 00AE930. This license upgrade enables the LSI MegaRAID SafeStore service which offers instant secure erase and local key management for SEDs. The two 2.5-inch front-accessible drive bays can be replaced with four 1.8-inch drive bays by using the ServeRAID M1200 RAID 5 Enablement Kit (00JX141). This kit contains a replacement backplane to connect the four 1.8-inch SSDs, however, to enable RAID 5 you will also need the ServeRAID M1200 Series Zero Cache/RAID 5 Features on Demand upgrade (00AE930). The two standard 2.5-inch SAS/SATA drive bays can also be replaced with new PCIe NVMe (Non-Volatile Memory Express) drives that are directly connected to the PCIe bus of the second processor. Such connectivity, when combined with SSD drives, ensures the lowest possible latency while still using a standard drive form factor. 2nd processor required: Support for NVMe drives requires a replacement drive backplane for the two 2.5-inch drives plus the second processor must also be installed in the server. The kit containing the backplane, NVMe Enterprise PCIe SSD Enablement Kit for Flex System x240 M5, is listed in the following table. Supported drives are listed in the "Internal drive options" section. The ServeRAID M5215 is described in the next section. The ServeRAID M5215 SAS/SATA controller is an advanced RAID controller based on the LSI SAS 3108 chipset. The M5215 replaces the onboard SAS controller in the compute node and supports high-performance RAID-0 and RAID-1 to the two internal 2.5-inch drive bays. The M5215 is installed at the front of the server over the top of the drive bays, as shown in the following figure. Note: The use of the ServeRAID M5215 requires that the second processor be installed. The part numbers to order the ServeRAID M5215 controller and feature upgrade are listed in the following table. The following figure shows the adapter, flash power module and backplane that are included in the option. The included backplane replaces the standard backplane that came with the server. The backplane also serves as the conduit to route the PCIe signals from the second processor to the RAID controller. 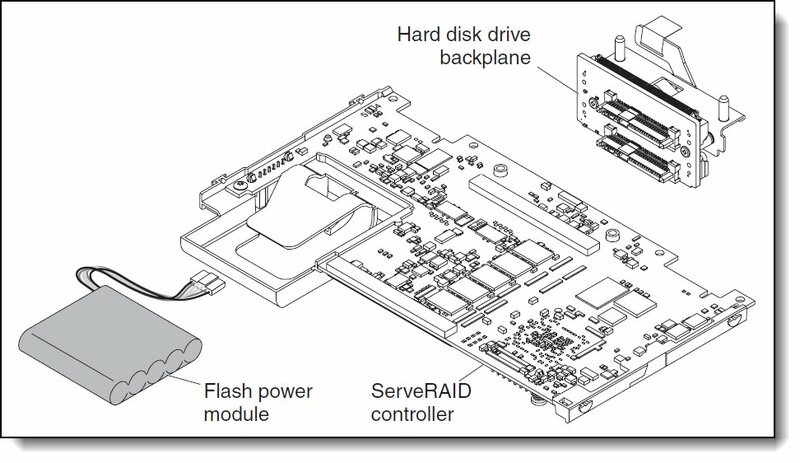 Note: The ServeRAID M5215 installed in the x240 M5 only supports two 2.5-inch drives using the supplied backplane. 1.8-inch drives are not supported. The Performance Accelerator upgrade (47C8710), implemented using the LSI MegaRAID FastPath software, provides high-performance I/O acceleration for SSD-based virtual drives by using an extremely low-latency I/O path to increase the maximum I/O per second (IOPS) capability of the controller. This feature boosts the performance of applications with a highly random data storage access pattern, such as transactional databases. Part number 47C8710 is a Feature on Demand license. The x240 M5 supports the attachment of the Flex System Storage Expansion Node. Withdrawn: The Storage Expansion Node is now withdrawn from marketing. The Flex System Storage Expansion Node provides the ability to attach another 12 hot-swap 2.5-inch HDDs or SSDs locally to the attached compute node. The Storage Expansion Node provides storage capacity for Network Attach Storage (NAS) workloads, which provides flexible storage to match capacity, performance, and reliability needs. The following figure shows the Flex System Storage Expansion Node attached to a compute node. The ordering information for the Storage Expansion Node is shown in the following table. Connects directly to supported compute nodes via a PCIe 3.0 interface to the compute node's expansion connector (see the internal view in the Locations of key components and connectors section). Supports 12 hot-swap 2.5-inch drives, accessible via a sliding tray. Supports 6 Gbps SAS and SATA drives, both HDDs and SSDs. Based on an LSI SAS2208 6 Gbps RAID on Chip (ROC) controller. Supports RAID-0, 1, and 10 as standard. JBOD also supported. Optional RAID-5 and 50 with cache upgrade. Optional 512 MB or 1 GB cache with cache-to-flash super capacitor offload and RAID 5/50 support. The use of the Storage Expansion Node requires that the x240 M5 Compute Node have both processors installed. 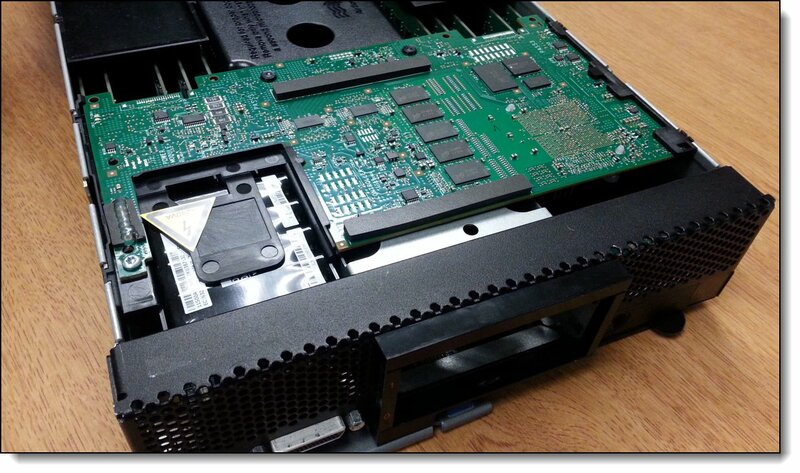 The Storage Expansion Node uses a different hot-swap drive tray (G2HS) to the x240 M5 (G3HS). As a result, the SEN drives and x240 M5 drives not interchangable. The server does not support an internal optical drive option, however, you can connect an external USB optical drive. See http://support.lenovo.com/en/documents/pd011281 for information about available external optical drives from Lenovo. Alternatively, use the remote media feature of the IMMv2 and the Chassis Management Module. Note: The USB port on the compute nodes supplies up to 0.5 A at 5 V. For devices that require more power, another power source is required. Some models of the x240 M5 (those with a model of the form 9532-x4x) include the Flex System EN4172 2-port 10Gb Ethernet Adapter installed in slot 1. Table 2 lists the models with this adapter standard. These models require that a compatible Ethernet switch be installed in I/O module bays 1 and 2 of the chassis. Some models of the x240 M5 (those with a model of the form 9532-x6x) include the Flex System CN4052 2-port 10Gb Virtual Fabric Adapter installed in slot 1. Table 2 lists the models with this adapter standard. These models require that a compatible Ethernet switch be installed in I/O module bays 1 and 2 of the chassis. Two-port 10 Gb Ethernet adapter. Optional support for FCoE and iSCSI via an Features on Demand license upgrade. Single ASIC controller that uses the Emulex XE104 design. 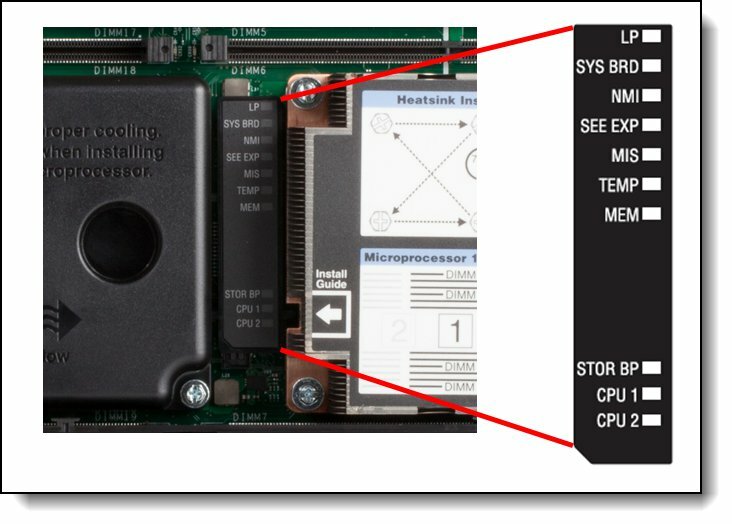 PCIe Express 3.0 x8 host interface (8 GT/s). Connection to 1 Gb or 10 Gb data center infrastructure (1 Gb and 10 Gb auto-negotiation) . Supports NIC virtualization (vNIC) up to four virtual ports per physical port. Supports Virtual Fabric Mode, Switch Independent Mode, and Unified Fabric Port Mode. The x240 M5 has two I/O expansion connectors for attaching I/O adapter cards. There is a third expansion connector that is designed to connect an expansion node, such as the Storage Expansion Node. The I/O expansion connectors are a high-density, 216-pin PCIe connector. 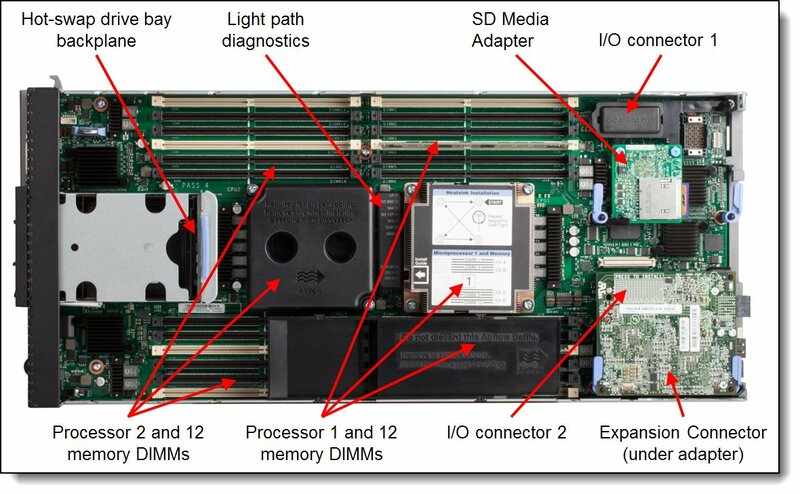 Installing I/O adapter cards allows the server to connect with switch modules in the Flex System Enterprise Chassis. Each slot has a PCI Express 3.0 x16 host interface and both slots support the same form-factor adapters. The x240 M5 supports the attachment of the Flex System PCIe Expansion Node. By using the Flex System PCIe Expansion Node, more PCI Express cards can be attached, such as High IOPS SSD adatpers, fabric mezzanine cards, and next-generation graphics processing units (GPU) to supported Flex System compute nodes. This capability is ideal for many applications that require high performance I/O, special telecommunications network interfaces, or hardware acceleration that uses a PCI Express card. The PCIe Expansion Node supports up to four PCIe 2.0 adapters and two more Flex System expansion adapters. The PCIe Expansion Node is attached to a Flex System compute node, as shown in the following figure. The ordering information for the PCIe Expansion Node is shown in the following table. Note: The use of the PCIe Expansion Node requires that the x240 M5 Compute Node have both processors installed. The following table lists the supported network adapters and upgrades. Adapters can be installed in either slot. However, compatible switches must be installed in the corresponding bays of the chassis. All adapters can also be installed in the PCIe Expansion Node. The "Maximum supported" column in the table indicates the number of adapter that can be installed in the server and in the PCIe Expansion Node (PEN). ** For x4x and x6x models (where an Ethernet adapter is standard in slot 1), only one extra adapter can be installed in the compute node. The following table lists storage HBAs that are supported by the x240 M5 server, both internally in the compute node and in the PCIe Expansion Node. The compute node supports the GPU adapters listed in the following table. These adapters are installed in an attached PCIe Expansion Node. † The K40 adapter is a double-wide card and occupies the two full-height PCIe slots. If installed, the adjacent slot is unavailable, however adapters can be installed in the two low-profile slots. ‡ NVIDIA GRID Kx and Tesla Kxx GPUs supported only when the x240 M5 has 1 TB or less memory installed. The x240 M5 supports the VMware vSphere (ESXi) hypervisor on one or two SD cards with the optional SD Media Adapter for System x. This adapter is installed in a dedicated slot beneath I/O Adapter slot 1, as shown in the following figure. When only one SD card is installed in the adapter, you can create up to 16 volumes, each of which is presented to UEFI as a bootable device. When two SD Media cards are inserted, volumes can be mirrored (RAID-1) across both cards, up to a total of eight mirrored volumes. The use of mirrored volumes improves system availability because the server remains operational, even if one SD card fails. The RAID functionality is handled internally by the SD Media Adapter. The light path diagnostics panel, as shown in the following figure. LEDs next to key components on the system board. The x240 M5 light path diagnostics panel is inside the server between the two processors, as shown in the following figure. To illuminate the light path diagnostics LEDs, power off the compute node, slide it out of the chassis, and press the power button. The power button doubles as the light path diagnostics reminder button when the server is removed from the chassis. SYS BRD A system board error is detected. SEE EXP A fault is detected in the adjacent expansion unit (if installed). MIS A mismatch occurred between the processors, DIMMs, or HDDs within the configuration as reported by POST. The server contains an Integrated Management Module II (IMM2), which interfaces with the advanced management module in the chassis. The combination of these modules provides advanced service-processor control, monitoring, and an alerting function. If an environmental condition exceeds a threshold or if a system component fails, LEDs on the system board are lit to help you diagnose the problem, the error is recorded in the event log, and you are alerted to the problem. A virtual presence capability comes standard for remote server management. Remotely viewing video with graphics resolutions up to 1600x1200 at 75 Hz with up to 23 bits per pixel, regardless of the system state. Remotely accessing the server by using the keyboard and mouse from a remote client. Mapping the CD or DVD drive, diskette drive, and USB flash drive on a remote client, and mapping ISO and diskette image files as virtual drives that are available for use by the server. Uploading a diskette image to the IMM2 memory and mapping it to the server as a virtual drive. The Flex System x240 M5 compute node complies with ASHRAE Class A3 specifications.